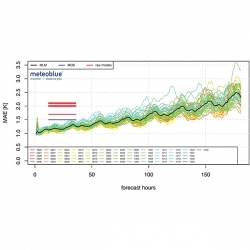 With the introduction of artificial intelligence in 2018, meteoblue has managed to improve forecast accuracy by computing a ‘most likely consensus forecast’ using more than 25 different forecast models and observations from over 50,000 weather stations. As a result, meteoblue is able to serve customers in the renewable energy, building management, agriculture, tourism, and media industries, in more than 50 countries. Meteoblue supplies hourly weather data from 1984 up to 14 days ahead for every point on Earth, with more than 30 variables in consistent and rapidly retrievable data sets, enabling access to detailed history of weather events, analysis of climate risk, site valuations, weather-based management strategies, and more.